This is the sixth painting in my series mapping the compass, helping to deepen my personal relationship with the six directions. This painting is taken from a journey upward, beyond the sky and the known stars, with the intent to meet the guardian spirit of the skies. 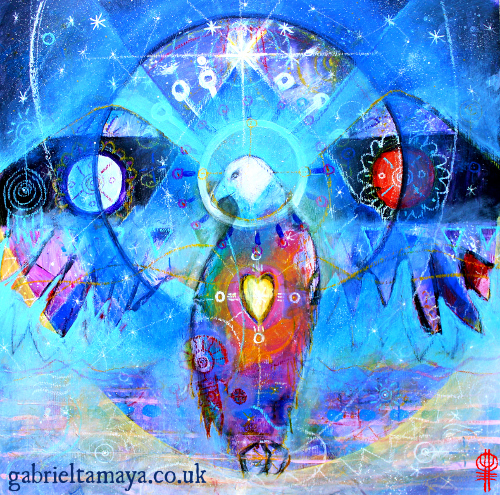 This journey was quite a contrast to the journeys and painting I last did for below, for Pachamama – the Earth Mother. It was so luminously spacious and expansive that it was almost overwhelming! Tenger is the Father of all Shaman and Medicine people from all times and cultures, and the stars the living ancestors of these lineages. This was a very powerful journey, which had some very positive repercussions for my personal path as well as specific guidance for mapping this journey through this painting. Tenger speaks of and reminds us of our true stellar origins, of holding personal power in a balanced way in this world, that we may truly real-ise and share our unique and individual Medicine at this time.